How do I create certificates for my students? Certificates can be a great way to encourage and reward students for taking part in a competition. We know that students love to be recognised for their hard work. Whether you ran an in-school competition through the Competition Manager, or just want to recognise students' consistent usage and improvement, you can use the below templates to create certificates for your students. We have Credit, Bronze, Silver, Emerald, Gold and Elite templates. 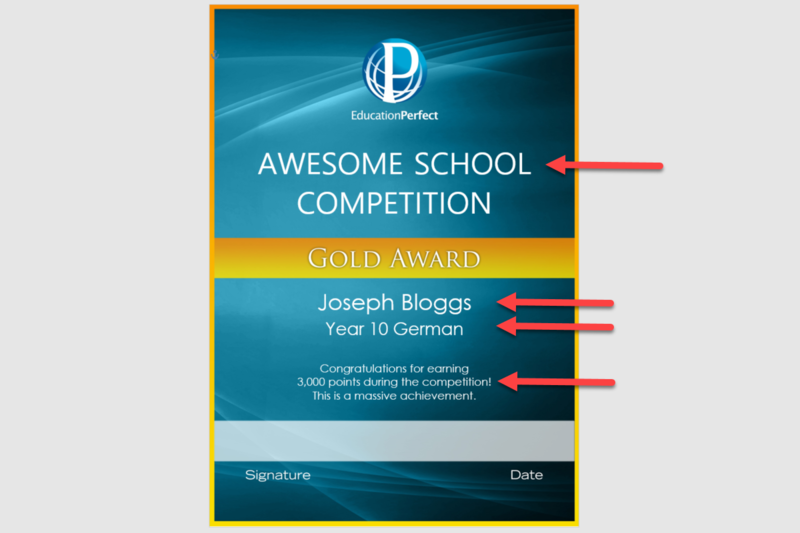 When you're setting up an in-school competition, the system will automatically recommend score levels for Bronze, Silver and Gold templates based on the length of the competition and how much work is available. The certificates are all editable. To personalise a certificate, simply select where you would like to make the changes and edit the text, the same way you would edit a word document. When printing certificates, we recommend printing at approximately 98% to ensure the coloured border isn't lost.